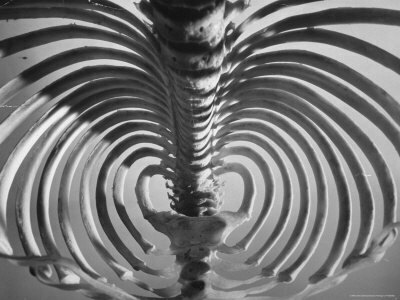 The ribcage consists of 12 pairs of ribs attached to the 12 thoracic vertebrae and the breast bone. They arc around from the back body to the front body forming the circumference of the thorax, protecting the heart and lungs. Most people think of their ribcage as rigid. Maybe it’s the cage part of the term. It does actually look much like a bird cage if you remove the shoulders. It’s narrow at the top and fuller at the bottom. But there is a lot more mobility in the ribcage than many of us think. The ribs have some capacity to in-flare and out-flare. This is partly due to the pliability of the cartilage attaching the ribs to the breast bone. They also lift on the inhale and fall on the exhale, respectively expanding and reducing the thoracic volume. The intercostal muscles, in between the ribs, are the muscles that lift and lower the ribs. Come to sitting sideways on your mat with the long edge of a bolster (or rolled blankets) on one side and bent legs on the other. Slide out so that you are side-lying over the bolster, pelvis down, knees bent, and shoulder either on the ground or just hovering. Let your head rest on your bottom arm unless that is uncomfortable. If it is, place your head on a folded blanket and bring your arm forward of the shoulder. Take a few easy breaths letting your spine softly mold over the bolster. From here, reach your top arm away from your ear and arc it up toward the ceiling, pausing right over the shoulder. Softly reach from your hand to your fingers with a soft spread over the front and back of the hand. Now bring your attention to the side of the ribcage facing the ceiling. The position will limit the breath in the underneath side and allow more breath to fill the side of the body facing the ceiling. Focus your attention here, allowing the ribs to lift and lower like handles of a bucket. The ribs will lift one away from the other up towards the sky on the inhale and fall back down toward the spine on the exhale. Begin to feel the connection of the expanding lungs and lifting ribs to the reach of the arm. As the lung fills and the ribs lift, begin to reach the arm a little ways over head. On the exhale, pause and re-stabilize your shoulder blade. Continue until the arm is reaching overhead. The bottom hand can grab hold of the top arm and add a gentle tug. Take a few breaths here. When you are ready, add the reach of the legs. Notice that the abdominals wrap from the back body around the breath toward the front mid-line. Softly press through the feet. If you would like to take this into a twist, keep the hips stacked while separating the legs; top leg forward and bottom leg back. From here roll the top side into the back space, letting the head fall to the floor or a blanket and the top arm or elbow reach into the back space. If that is painful for the shoulder, let the hand come to rest on the belly. Find the pleasure in the pose. Breath and rest deeply into it. To come out, rewind back to sidelying, bend the knees in, let the hand fall to the floor, and slowly push to sitting. Switch sides. Just as we began to divide the pelvis into two halves, it can also be interesting to look at the ribcage as if we had two ribcages, a right one and a left one. Imagine for a moment you were in tadasana with your arms reaching overhead. It’s possible to conceive of the body as two long tubes from the foot all the way up to the hand with a spine in between. Each tube can rotate toward the front mid-line (in-flare) as well as away from the front mid-line (out-flare). And each tube can spiral on its own individual axis. The two tubes can also spiral around each other like the image of ida and pingala – two snakes coiled around one another with shashumna in the middle. Consider a simple seated twist. Begin sitting tall with the legs in your favorite position. Let’s turn to the left. Feel the little turn begin in your pelvic floor and then let the belly begin to wrap. Pause. Starting in the diaphragm and the base of the ribs, begin to spiral from the sternum to the left along the length of the ribs into the spine, wrapping the left rib cage into a spiralic out-flare. Then from the spine, follow the length of the lower right ribs toward the sternum, wrapping the right ribcage into a sipralic in-flare. Continue to travel this way through the ribcage. Letting both sides spiral on their individual axes as well as spiral wound the central axis of the spine. Continue the spiral through the soft tissues of the throat and cranium. When you are ready release and go to the other side. Remember to keep the spine nice and long in the middle.